Yip folks, it's that time of the month again! Can you believe that we are heading into the third month of the year already?! Time really does fly and it still feels just like yesterday when we opened our *virtual* doors and began our journey. Remember our handbag post? Or how about our first real wedding feature? And of course we can't forget Kim's trip down to Kalk Bay! We've made so many memories already, and we can't wait to share more with you! 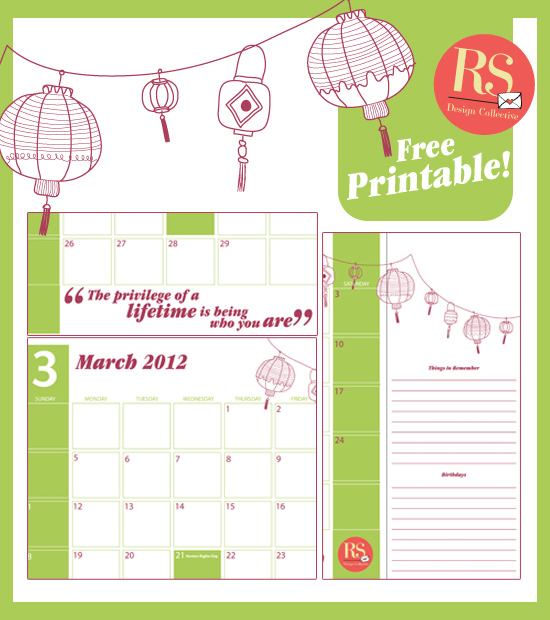 Let's start off the month well by downloading our FREE calendar here! 02 - 04 The NWJ Bridal Fair at the Durban Exhibition Centre is the wedding fair to attend if you're in KZN. So if you are planning a wedding, head on down there! 03 Our favourite market, the I Heart Market is happening again at Moses Mabhida stadium - and its always so conveniently placed around pay day! 04 If the I Heart Market wasn't enough to quench your shopping thirst, the Wonder Market is happening the following day at Chris Saunders Park in Umhlanga. 09 For all the rock fans out there, Ramfest is hitting Origin. Check out the details and line up here. 21 - 25 Decorex Durban is hip and happening at the Durban Exhibition Centre. Go there for all your household décor and renovation needs. 22 - 24 Missed the NWJ Bridal Fair? No worries, the South Coast Bridal Fair should keep you covered. Here's to another month spent with our readers and another month of whimsical, feel-good vibes! Calendar originally designed and copyrighted to Ruby and the Swallow. No replication for sale is permitted.